Home›For Coaches›Forehand – other arm? The forehand stroke has changed a lot of the years with a grips becoming more extreme, racquet technology always improving and rotational power more prevalent than linear power. The role of the other arm has always been important but different grips can impact how far around the body the other arm needs to go on the backswing. If you correctly use your other arm you will get more power, more spin and a better ball contact position. If you look at Novak below and how important to role of the other arm is to his forehand. If you think of your other arm being the way to load up your elastic band on the forehand. 1. Stand facing forwards (no racquet needed) and then with your non racquet arm bring it across your body until it faces the other side. Feel the elastic band effect in your torso. 2. Track the ball and then catch it in your other arm rather than hit it. 3. Use a medicine ball to do forehand throws. This will teach the body how the left and right arms (and torso) can work together. 4. Hit some two handed forehands. Similar to the medicine ball this will get everything working together. 5. Hit more inside out shots. 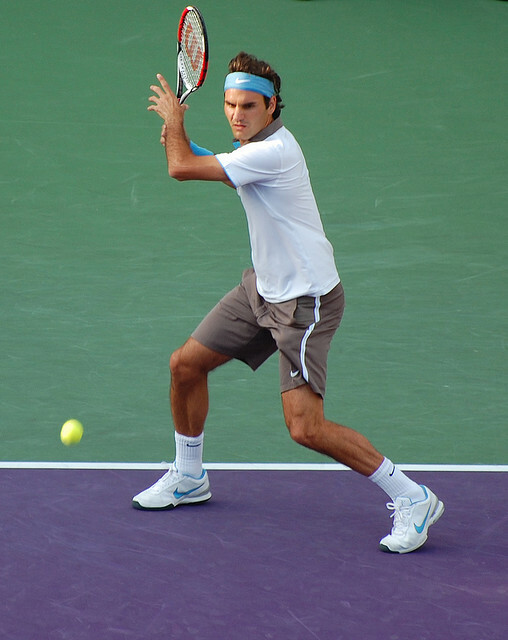 Practicing hitting your forehand from the backhand corner will naturally draw the other arm around. 6.The drop feed is a tremendous way to improve your own tennis and is a big part of our lessons at Scarborough Tennis Academy. A coach can drop feed for you but the self drop feed can be even more beneficial, particularly if your working on improving your rotation or racquet head speed. A great demonstration here of the drop feed, inside out forehand below. I hope some of this helps and if you are in Perth, Western Australia, come down and see us at The Scarborough Tennis Academy.